Bombay Sapphire Gin is a popular Gin available from Tesco Groceries in 1l to buy online. Visit Tesco Groceries for the best price for 1l of Bombay Sapphire Gin or compare prices on our other Gin products. Refined from 100% neutral grain spirit. Bombay Sapphire has a fragrances of ten exotic botanicals coupled with a one of a kind distillation process. The combination of lemon peel, juniper berries, almonds, coriander, liquorice, angelica and cassia bark is fused according to a recipe dating back to the mid 1700's makes Bombay Sapphire the most elegant and versatile gin on the market. 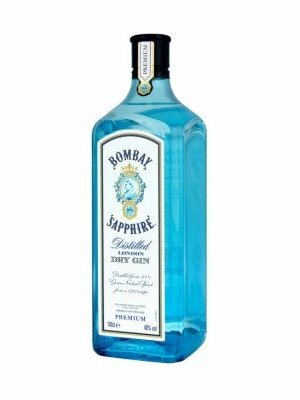 You can buy Bombay Sapphire Gin online in most retailers and find it in the Gin aisle in supermarkets but we found the best deals online for Bombay Sapphire Gin in Tesco Groceries, DrinkSupermarket.com, and others. Compare the current price of Bombay Sapphire Gin in 1l size in the table of offers below. Simply click on the button to order Bombay Sapphire Gin online now.